Nathan Delfouneso says relegation from League One is something that never even crossed the mind of Blackpool’s players. The Seasiders were tipped as one of the favourites for the drop this season but they’ve defied those odds and are now just a win away from clinching a top half finish. 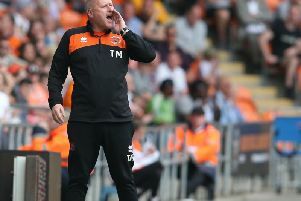 There was a time when it looked as though Pool could be dragged into a relegation scrap, but their superb recent form has seen them climb away from the bottom four. “We’ve always had that belief and confidence, even when we had some runs where results weren’t going our way,” Delfouneso said. “Within the camp we always knew we could do something. “We were probably down as strong favourites to potentially go back down, but I don’t think that ever crossed our minds, even when we had periods where it looked like we might be dragged in. “There’s been plenty of times over the season where we’ve shown we’re capable of being right up there. So we’ve got to take that into next season. “But we’ve still got one game left so we want to finish strong and finish on a high. Pool will be looking to build on last weekend’s 1-1 draw against Shrewsbury Town last weekend as they prepare to take on Rotherham United this Saturday. “You’re not going to get three or four every week. I know we’ve been very ruthless lately but it’s not going to happen every game,” Delfouneso added.